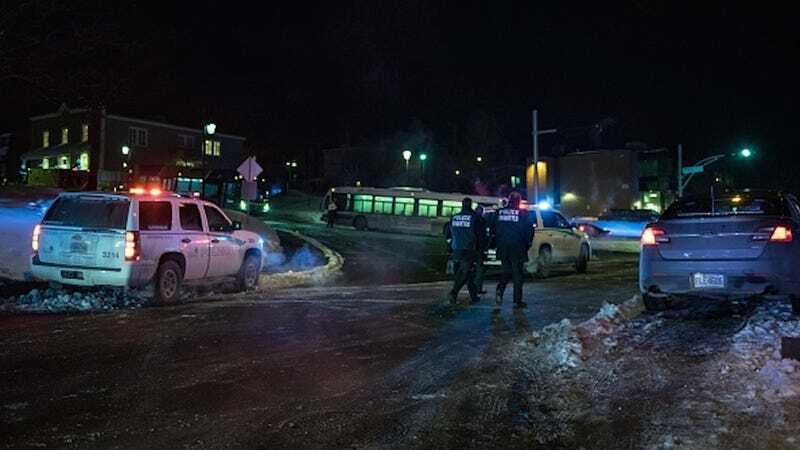 At 8 p.m. the Québec City Islamic Cultural Center on Sainte-Foy Street was holding evening prayers, when three gunmen burst into the building and began shooting. Five are dead, and many more injured. According to the Guardian, approximately 40 people were inside the mosque during the attack. The mosque’s president, Mohamed Yangui, was not present, but received panicked calls alerting him to the shooting. He confirmed the death toll, but because the injured were taken to various hospitals in Québec City, is unsure of their number. “Why is this happening here? This is barbaric,” he said to the Guardian. The mosque has been targeted before, though the circumstances were far less deadly — but nonetheless grotesque. In June, during Ramadan, a pig’s head was left at the building. Reports indicate that tonight’s shooting will be treated as an act of terrorism. A police spokesperson says that two arrests have already been made. Prime Minister Justin Trudeau has issued a statement via Twitter. And Ralph Goodale, Canada’s publics safety minister, tells the Guardian that he “is deeply saddened” by the bloodshed. We’ll add to this report as we learn more.